I’m going to camp! I never did as a child — Cuban parents don’t allow that. They’re, let’s say…a bit over-protective. So earlier this year when the opportunity presented itself for me to go to camp with girlfriends, I was the first one on the plane! It was amazing…relaxing, hilarious, nurturing, FUN, validating, emotional, revealing, but most of all, it helped me feel connected. It’s no wonder Oprah called Campowerment one of the top 50 things that make you say WOW! Now, I’m going back. This October’s Campowerment in Florida is all about the power of positivity. It’s for all women, but they’re making it extra special for “us” — celebrating survivors/thrivers and the girlfriends (and other angels) who carried us on their wings. We all know who they are: the ones who never left us when we were scared, shocked, sad, in pain, and ultimately celebrating our recovery. Camp is an amazing way to spend time with that special posse, away from the everyday grind. 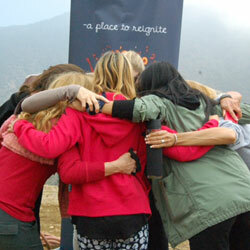 It’s the magic of camp with a dose of empowerment thrown in, with strangers supporting each other. That’s the life-changing part. The power of girlfriends is undeniable. When I look back to the moment I was diagnosed with breast cancer, I am still overwhelmed by the community of women who rallied around me, holding my hand and my heart every step of the way. An only child with no children of my own, I’ve always cherished my girlfriends. They are my family. During the tough moments in my life, they’re the ones who have been there, front and center. Like when I lost my mom Daisy to breast cancer at 59, they were there. And when I got the “You have cancer” call, they were there, too. En masse. Yes, they were freaked out that I was popping champagne as I broke the news of my own diagnosis, but they were ready and willing to go through breast cancer with me, on my terms. I wanted to be the Cancer Dancer and dance my way through it all. They agreed to be my partners. I count that year and a half of surgeries and treatment among one of my life blessings. Of course it was difficult, overwhelming, scary, and painful at times. No doubt. But I was spending my days and nights with my girlfriends. They were pampering me. It was so full of unconditional love that it really became a beautiful and loving experience. We carried on in our rowdy, themed chemo parties as they brought in home baked goodies for the nurses and other patients trapped for hours in those boring pods. We’d conga through the halls and raise a little hell, along with some eyebrows, but we laughed a lot, and welcomed in the Sacred Juice (my name for chemo) that would ultimately kick cancer to the curb. These days, 5 years later, I surround myself with beautiful courageous souls walking through the same health challenges. They come into my life, almost daily, sent to me from around the world by doctors, friends, nurses, even strangers. My Positively Pat health and wellness community has grown to become a resource of support, information, encouragement, hope, and inspiration. The cornerstone is the support group called the Link of Hope Sistas: women helping women on the path to health. As October approaches and the world gets ready to go pink, I’m heading back to Campowerment, where makeup is discouraged, sweatpants are required, phones are turned off (egad!) and there are no TVs or computers. It is a nurturing disconnect for 3 nights. I am ready to laugh with my sisters, roast some s’mores around the crackling campfire, and belt out the Beatles and Beyoncé. I don’t think I’ll personally jump off the zip line this time, but who knows…stranger things have happened. Once again, I will share my joyful dance through cancer with the group, with the hope of encouraging all to face every challenge with faith and strength…focusing on the gifts that always come along for the ride. It’s playtime. Come have fun with me and my posse. Bring yours, or come alone. Campowerment happens on October 11-14 in Orange Springs, Fl. If not now, when? Check it out at www.campowerment.com. Tell them you saw this on Breastcancer.org and you’ll get a special discount! Patricia San Pedro is a breast cancer survivor. She is founder of Positively Pat, a health and wellness community. Pat is the author of The Cancer Dancer: Healing One Step at a Time, which guides women and their caregivers, step by step, from diagnosis to treatment. Pat founded the support group "Link of Hope Sistas.” Pat's healing journey became a Discovery documentary called The Cancer Dancer, which received a 2012 Suncoast Emmy Award. Pat is owner of San Pedro Productions, a public relations and media training company. Her career spans several industries including television (in which she won four Emmy Awards), radio, music, publishing, and the airlines. In 2005 she co-authored a book called Dish & Tell, which was later turned into a musical. Pat is also an exhibited photographer and a keynote speaker who loves to inspire joy, a life of balance, and purpose. What an awesome article. Pat is a savior to a lot of us fighting the battle. Patricia: I wish I could go. It sounds like so much fun. Nice for such an initiative,Campowerment! I hope to join such camp activities in the future to give support to sisters in need and feel fulfilled. Am always happy to see breast cancer survivors, it consoles me that one day we at the developing countries will reach such a destination. We have started the hike! I hope to join such camp activities in the future to give support to sisters in need and feel fulfilled. It sounds like so much fun.